Published: Dec. 2, 2016 at 11:19 a.m. Updated: Dec. 2, 2016 at 11:28 a.m.
Lucky Week 13. It's make-or-break time. Time to do or die. Time for the best and brightest to shine. We're separating the wheat from the chaff. The cream is rising to the top. Enough cliches for you? Okay, good. Let's dispense with the chit chat and get to the Stock Watch. At the time of this writing, Luck hadn't officially been cleared from the league's concussion protocol but the Colts quarterback was back to work getting in some practice time ahead of Monday night's game against the Jets. 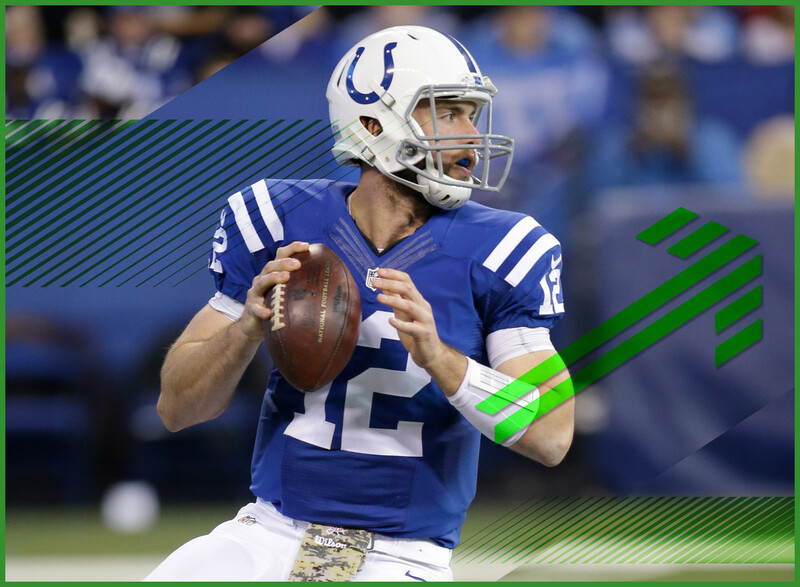 It's a reassuring fact not only for Luck himself but for the other key pieces in the Indianapolis offense. If the quarterback is a go this week, everyone else's value goes up accordingly. The dynamic tight end is still dealing with significant pain in the shoulder he injured on Thanksgiving Day and has been merely an observer at practice so far this week. It's extremely unlikely that he'll play this week yet we wait on a more forward-looking prognosis. In the meantime, it should mean more snaps and targets for the resurgent Vernon Davis. Coleman made his return to the lineup last week after missing several games with a hamstring issue. The fact that he scored a touchdown masked an otherwise lackluster day. But the good news comes from reports that Coleman is starting to look like the back he was earlier in the season. We'll see if he's still affected by the recent success of Taylor Gabriel, but it is still an encouraging sign. The upside is that Watkins was able to practice this week. The downside is that he is still dealing with lingering soreness in his foot and continues to be limited in the Bills workouts. The injury has hampered the otherwise talented wideout all season long and is becoming one more story in the narrative of a dynamic, but oft-injured receiver. He is expected to play, but his ability to manage the pain will be the key factor in how effective he can be. Just as Ajayi's success on the field can't be completely owed to Ajayi, neither can his stock watch rating this week. After missing 60 percent of his offensive line over the past couple of weeks, it looks like the Dolphins running back is getting some help. Signs point to Laremy Tunsil and Branden Albert being back on the field this week. We'll see what the verdict is on center Mike Pouncey. The matchup against the Ravens isn't a favorable one, but this development should help at least a little bit. The worst fears of Patriots fans and fantasy owners have come to pass with news that Gronk is going to miss several weeks after undergoing back surgery. That means New England will likely be without its biggest offensive weapon until the playoffs and fantasy managers could be forced to go without him for the remainder of the season. It also thrusts Martellus Bennett back into the spotlight. Nonetheless, this injury blows a huge hole in an already-thin position. Mathews sat out last week's game with a knee injury and now comes word that the issue is "pretty significant." We don't know exactly what that means, but it almost certainly signals that Mathews won't be available for this week's contest against the Bengals. It will be the Sproles and Smallwood Show yet again this week. A miserable season for Ivory continues. The Jaguars running back has alternately dealt with injury and under-performance. This week, it appears that the former has again reared its ugly head. Ivory hurt his hamstring in last week's loss to the Bills and hasn't practiced this week. To make matters worse, T.J. Yeldon is also dealing with an ankle injury that has him questionable. That backfield has always been a mess. Now it's one to avoid completely. Yes, I'm still trying to make "woke" happen. Do not @ me. Packers coach Mike McCarthy talked up Michael this week, saying he was impressed with how quickly the back has picked up the playbook and says the team would like to get Michael more touches this week. Considering how ineffective James Starks has been with his workload recently, that would be very welcomed by fantasy managers. Peterson has been seen running at practice this week and reports put him on track to be back on the field for the Vikings sometime in the next few weeks, with Week 16 being the likely target. That makes him a name that plenty of playoff-bound fantasy managers will pick up and stash. The bad news is that you're talking about potentially starting a player who hasn't been on the field since Week 2 playing behind a bad offensive line. That's a dicey proposition in what is potentially a fantasy championship situation.